Georgia Timms’ goal was the difference at Court Place Farm as Oxford United beat Chichester City in the 1-0 FA WNL southern premier. A few changes were made to the City starting line-up after the 5-2 win over Milton Keynes Dons two weeks earlier as Sharna Capel-Watson, Cherelle Khassal and Hollie Wride started against Oxford and new recruit Kim Stenning made the bench. There wasn’t much to talk about in the opening exchanges although Chi created more chances, but keeper Lucy Thomas was alert from the off and raced off her line before Khassal could nip the ball past her. Catherine Beaver had the first goalscoring opportunity but her header was kept out at the back post. Chi mounted some pressure and Sara Tubby’s lovely dinked ball found Molly Clark, but she was denied her tenth goal of the season. Tash Stephens put an effort straight at Thomas, whose clearance found Wride on the edge of the box, but the midfielder couldn’t find the net. Both teams carved out threatening moves but the finishes didn’t trouble either keeper – though near the half-hour mark Lauren Dolbear saved well at her near post, denying Timms. Pace seemed the key for Chi and Khassal used hers to break into the box and unselfishly square to the primed Tubby, but she didn’t get the right connection. It was goalless at the break and the visitors seemed slightly on top and it was Chi who started the brighter of the two sides in the second half. Molly Clark had an effort blocked before Tubby jumped on a defensive error only to shoot straight at Thomas from an angle. The Us failed to deal with a Chi corner which fell to Tubby, but the striker couldn’t get her foot through the ball. 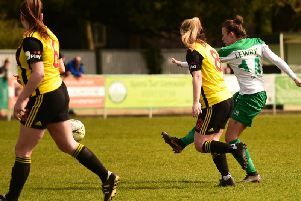 With an hour gone Aaron Smith introduced Stenning for her Chi debut and the striker looked keen to pounce as Thomas didn’t fully grasp Clark’s 25-yard strike but she held on before a goal could be found. Another long-range effort from the ex-Bristol City player grazed the roof of the Oxford net. With 66 minutes played the deadlock was broken and the goal went to the hosts against the run of play. Chi failed to clear an Ellie Noble corner which fell to Timms to head home. Now on the back foot Chi had to find something and it nearly arrived for Stephens with a great strike from 25 yards that caught Thomas off of her line – but the keeper raced back to palm the effort over the bar. Dolbear came out strongly to block Emily Allen’s advance as Chi turned up pressure. Thomas was kept busy in the dying moments of the game as she claimed aClark shot and blocked Khassal in a one-on-one. Nearly five minutes of injury-time brought five more chances for Chi to bag an equaliser but Thomas pulled off some heroics and the defenders’ bodies blocked the goal to keep City out. The final whistle was a blow for the league leaders, but this was only their third league loss of the season. This time last year Chi were 7th in the league with 19 points – 14 fewer than they have now. City are still five points clear at the top although second-placed Coventry have four games in hand. Chichester City go to face Portsmouth Women in the league at Baffins Milton Rovers’ ground on Wednesday (7:45pm). Chi City Ladies: Dolbear, Cheshire, Waine, Taylor, Capel-Watson (Ogle 77’), M Clark, Wride, Barron (L Clark 46’), Tubby (Stenning 60’), Stephens. Unused subs: Lewry, Ingram.